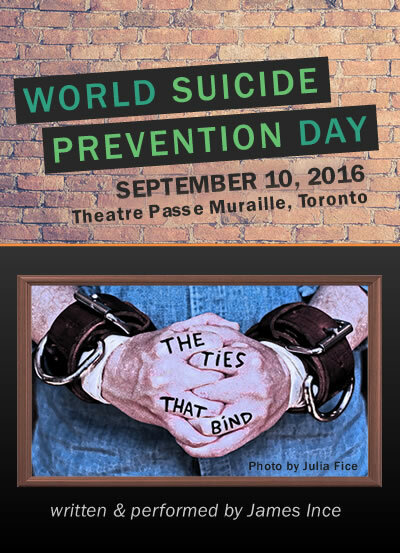 On September 10, 2016, the ASR hosted a World Suicide Prevention Day (WSPD) event in Toronto featuring a special performance of The Ties That Bind, written and performed by James Ince. The Ties That Bind is a brutally dark comedy about society’s perception of mental illness. Sam Ward has spent most of his life trying to deal with the fact that he is not normal, which is normal to him. Plagued by peers, bosses and parents who cannot understand how he is feeling – but condemn him for it – Sam finds himself alone and broken. With humour and humanity to guide him, Sam tells a true story of surviving mental illness, rather than the stigma of suffering from it. Depression, loneliness, impossible self-imposed expectations, depression, the life-long effects of bullying, homophobia, work, depression, gut-wrenching disappointment, false friends, loneliness, depression. Proceeds from the event supported suicide research and clinical interventions with the ASR Suicide & Depression Studies Program. Thanks to the generosity of the Canadian Biomarker Integration Network in Depression (CAN-BIND) Program, a limited number of complimentary tickets are being offered to The Ties That Bind. Eligibility: These complimentary tickets to The Ties That Bind are offered for non-professionals on a first-come, first served basis. Non-professional status means that you are attending the event as a person with lived experience with mental health challenges, or you are attending in support of someone with lived experience. Professionals with lived experience will not be eligible for these free tickets.